• 48 Fully controllable Construction, Reconnaissance andDisastermanagement vehicles -Trains, Helicopters, Fire truck,Tractor,Digger, Compactor, Telescopic crane, Bulldozer, Ships,Trailertrucks Container cranes, and much more. • Build Buildings, Bridges, Railway tracks, Under WaterMetrotunnels. • Defuse mine, Rescue civilians and Dispose radioactivecanisterssafely. Construction World is like a tractor game, a driving game,abridge building game, a racing game, all in one! It is theultimateConstruction game!! 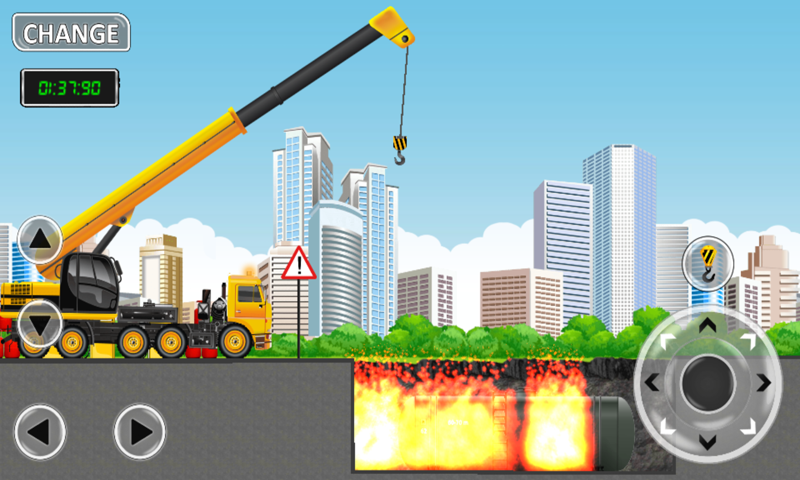 Construction World is a free construction city puzzle constructiongames with construction crew where you control construction vehiclelike telescopic crane, compactor, excavator, truck, tractor,helicopter, forklift to rebuild a city heavily damaged by anearthquake with construction vehicles. If you love the task ofvirtual construction, then this game is simply meant for you. Withconstruction game download you actually get a chance to explore: •6 disaster worlds to rebuild in your own style • 100 levels withrealistic control • 48 Fully controllable Construction,Reconnaissance and Disaster management vehicles -Trains,Helicopters, Fire truck, Tractor, Digger, Compactor, Telescopiccrane, Bulldozer, Ships, Trailer trucks Container cranes, and muchmore. • Stunning high-quality Graphics • Build Buildings, Bridges,Railway tracks, Under Water Metro tunnels. • Defuse mine, Rescuecivilians and Dispose radioactive canisters safely. ConstructionWorld is a Simulator game, Tractor game, a Driving game, a Bridgebuilding game, a Racing game, Physics Puzzle game all in one! It isthe ultimate Construction game that offers a vast freely navigableworld for you to discover!! So, download construction games toexperience unlimited fun! Hope you love Construction World. This isone of the best construction games for android users who crave fornever ending entertainment. Construction World is the best FreeConstruction Game on the Play Store! It allows you to exploremultiple thematic worlds while applying realistic physics. So,complete multiple levels by using all those amazing powerfulvehicles and take control. All pilots get ready for the ultimate test of skill andagility.Crazy planes will test your speed and accuracy to maneuverthrough some of the toughest obstacles you can face in the openskies.From Rings that are fly to Rings that glide in the skies.Challenge your skills to perform better than the otherpilots in theworld and prove your supremacy in the skies.From Sky tunnels toFuel dock's, you'll never run low on Surprises and Challenges.Dodgethe Fiery Arms that spin crazy and always on your tail to make sureGravity gets the better of you! !Add to that nature will throw a fewsurprises on your way to glory!You might have an Extraterrestrialencounter as well.Beware:The skies can drive you crazy by theircomplexity and challenges. You need to be the ultimate Crazy Pilotto pass these skies successfully.Are you Ready !!! The menace of the migratory birds from the north has left theotherwise cheerful citizens of Newvale very frustrated. Frequentbreakages of Power lines have left the city in darkness. The mayorof the city has passed a resolution in the city council to chasethese birds from the power lines. Accordingly rewards will be givento anyone who can chase these birds off the power lines and out ofthe city. Are you ready for the challenge? Inviting all passionateBird chasers to the city of Newvale.Presenting to you the newestand the most addictive Android game "ELECTRIC BIRDS". This gamewill give you a chance to prevent a city from plunging intoDarkness. Shoot down the stubborn birds on the power lines and alsoprotect the Angel Penguin. So go on, use your fingers and chasesome birds. Implement your strategies to keep the power linesintact and help the city to remain lit. 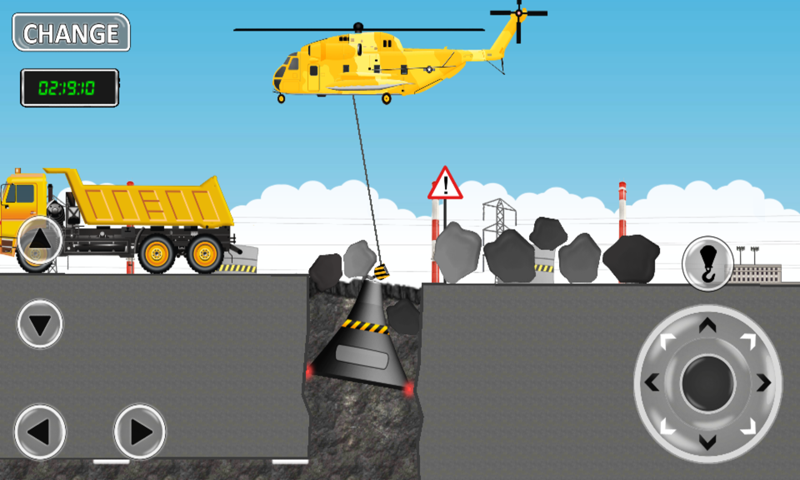 This is the AD free version of the superpopular Construction World gameConstruction World is a free construction game where you controlconstruction vehicles like crane, compactor, excavator, truck,tractor, helicopter, forklift to rebuild a city heavily damaged byan earthquake• 6 disaster worlds to rebuild• 100 levels• 48 Fully controllable Construction, Reconnaissance and Disastermanagement vehicles -Trains, Helicopters, Fire truck, Tractor,Digger, Compactor, Telescopic crane, Bulldozer, Ships, Trailertrucks Container cranes, and much more.• Stunning Graphics• Build Buildings, Bridges, Railway tracks, Under Water Metrotunnels.• Defuse mine, Rescue civilians and Dispose radioactive canisterssafely.Construction World is like a Tractor game, a Driving game, aBridge building game, a Racing game,Physics Puzzle game all in one!It is the ultimate Construction game! !If you liked Construction games like Construction City, TractorDigger, Construction Crew then you will love ConstructionWorld.Construction World is the best Free Construction Game on thePlay Store! Jump over obstacles and race against rising water in the Arcticisland. Gameplay like doodle jump, happy jump and jelly jump.Thisgame depicts the threatening effects of global warming and climatechange on the life in the polar region.Global warming has destroyedmost of the penguins of Arctic land; there is only one penguin leftin this fast melting Arctic land which is trying to find its escaperoute. Can you be the one to save this penguin ? ?Guide the penguinby jumping through the ice platforms, watch out for a number ofunexpected obstacles coming its way, your momentary distraction cancost the penguin’s life. Collect as many coins as possible on theway which will help the penguin to survive in the manmade World!You can also compete with your friends and find out who is leadingin saving the penguin.Features:-Collect as many coins and winachievements-Expect the unexpected falling obstacles-Challengeyourself to jump on moving platforms-Avoid the choppy wheels-Globalleader boards to compete and know your position How to play: Tiltphone to move left or right, tap the screen to start. Sky Fall is a simple and fun arcade game, you are guaranteedhoursof non-stop fun. Play Skyfall and challenge you buddies tobecomethe king of color. There are 3 modesGuide colorful ballsthroughobstacles to become the championThe Falling Colors are boundtogive you a colorful time playing this new arcade game andchallengeyour buddies to become the ultimate king of colors. This version contains no advertisements!- progress from your freeversion is automatically transferred to paid app!Construction Cityis a construction game where you can control 12 machines, such ascranes, excavator, trucks, tractor, helicopter, forklift and more!Use those powerful vehicles to complete all levels!• 9 thematicworlds • 189 levels • 12 fully controllable construction vehicles -telescopic crane, excavator, bulldozer, tractor, trailer truckstower crane tipper, trailer trucks, and even more.• level editor,create your own levels and share with different players!- buildbridges and buildings• realistic physicsConstruction City is like atractor game, a driving game, and a bridge building game, all inone! Progress from free version will be automatically transferred:please make sure your free version is 1.0.7 or higher, your deviceneeds SD card to be able to retrieve saved game progress! Pleasecontact us if you have any issues! Tractor Crew is the next exciting tractor game, brought to you byKurius Games! If you enjoy games like Construction City and TraktorDigger, then you will love Tractor Crew: Operation Cleanup! Controlseveral different tractors and trucks to clean the environment oftoxic waste! Over 100 levels! 7 tractors and trucks! Realisticphysics-based environment! Progressively challenging levels! HDgraphics! Kid friendly! Built using Unity, available on multipleplatforms! Bustling city is a concrete jungle with many uprising buildings andsome are under construction. This requires steadiness and heavyduty machinery and truck vehicles rounding the city to transportraw materials like bricks, cement, paver and metal. With CityTrucks Construction Kids, your little toddler can learn all aboutthe sound and the name of the construction trucks such asexcavator, compressor, concrete mixer, truck, digger, crane,bulldozer, forklift and more. In this kids construction games, wealso introduce building construction heavy machinery vehicle trucksexcavating, signs and tools used by the crews. You can explain andteach to your child the meaning and usage for buildingconstruction. City Trucks Construction Kids is a fun interactiveactivity truck imagepuzzle game app designed for all ages. Yourkids will enjoy the interactive animated sound flashcards, variouscool set of memory games and awesome truck themed puzzles. Yourlittle one can pretend to be a construction crew by building up theblocks in our block game. When you download this free City TrucksConstruction Games for Kids, you will get: Truck and DiggerVehicle Sound Interactive Flashcards Not only you will see a coolanimated picture, you will hear the sound effect and the word onthe interactive flashcard when you tap on the finger icon. This issuitable for all ages. Heavy Vehicle, Sign and Tool MatchingGames Fun continues with construction games for toddlers free. Wehave 4 sets of controllable matching thematic memogame. Theseinteresting hidden objects behind the flip cards. It will keep yourchild interested and focused. These match games will help keepmemory skill active. Construction Vehicle Themed PuzzleGames This engaging puzzle games for children age 4 and up has 6different cool city puzzle to solve with no time limit so you kidscan concentrate while playing. It will help them with problemsolving skill. Tap “Randomized” to shuffle the puzzle pieces and ifyour child wants to shuffle again, simple tap randomized again.These engaging puzzles will help promote fine motor skills,reasoning and concept development and early math skills. It alsodouble up as flashcards with word in puzzle. Building ConstructionBlock Game Your child can pretend to be a building crew and helpbuild up city tower with colorful blocks. Match the shapes to fillin the gap. Each block is controllable. You can rotate theclockwise or anti clockwise to fit and stack up the blocks. Yeah there you have it. All fun games and fun with City TrucksConstruction Kids. Go ahead and download the app. It will keep yourtoddlers entertained for hours. Beep, beep beep! Back up and dig in for some cool constructionmatching fun with the Construction Truck Games Free Match 3. If youor your little one loves trucks and construction vehicles they willhave an excellent time playing this easy to download game. Perfectfor younger children and still addictive enough to tempt adults theconstruction games free is easy to use and challenging at the sametime. 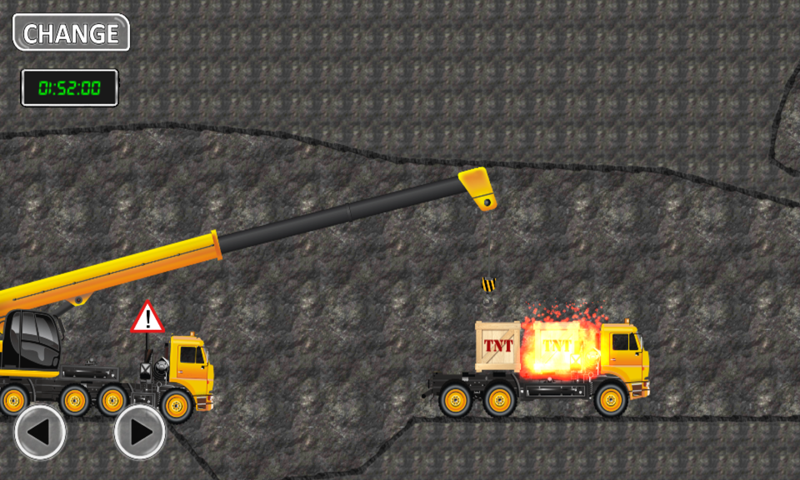 This free construction games features construction vehiclesand trucks that increase as you get higher in the levels, so itstarts simply enough to allow for easy no pressure game play. Andas you get better the levels will increase the amount of coolconstruction trucks that you match making this construction gamesfor toddlers entertaining for a long time. There are some coollearning elements in the construction games for kids also. Theyinclude:-Improving fine motor skills.-Matching skills.-Colorspractice.-And construction truck knowledge! This kids constructiontrucks for free is an easy way to promote learning through play.Have a diggity digger fun time and delve into the world of awesomeconstruction trucks with the Construction Truck Games Free Match 3,and have a blast learning through play with a MobiliSize App forToddlers and Kids.Note: This game does not contain ads fromsensitive categories. Matching ConstructionApp Game also measure the success of theplayers, when players compete.To test the ability of other playersand the players have the child until adulthood. Play withfriendsThe play within the family as well.Increasing anindividual's skills, intelligence and concentration.Each memoryGame over when play ends are measured in points, then began testingthe next time.The benefits of playing this game- To practice memoryin our brain for the better.- Adding intelligence To player- Havefun when playing with friends.- Playing time as well.Thanks for allthe comments, all the votes I download all the apps are good toplay a lot more. The Construction Game for Kids is a timed three round matchinggame, featuring an awesome Construction Puzzle. The first round inthe Construction Game for Kids is 100 seconds and each after thatis 10 seconds less, so you will have the time to improve eachround. Another thrilling feature to the Construction Game for Kidsthat makes it even more awesome then just a matching game- you mustfind the icons that link together in some way! When you make alinked match the Construction Game for Kids will show the link. Youalso get some help along the way. You can use the REFRESH button 3times, this mixes up the game cards so it is easier to find linkingmatches. You can also use the FIND button 3 times, and this willfind the matching links for you. This Construction Game for Kids isan addictive race to find the matching links, that gets harder eachround. Have Fun!!! Construction Team person puzzletoys,construction toys, children's imagination. Jump into the addictive fun puzzle games from Puzzle Questions -the very best in logic games on Android that will keep your mindactive and have you playing for hours!We include 7 differentpuzzles to challenge your brain that will keep both you and yourkids busy for hours. People of all ages will have fun with ourAndroid puzzle game.Classic jigsaw puzzle fans of all abilitieswill love our beautiful photo puzzles with automatic saves allowingyou to continue your challenge whenever and wherever youwish.Picture puzzle fans have four different play modes where thephoto puzzles are split into blocks and have to be put backtogether. Slide puzzles, rotating puzzles, swap puzzles and swapand rotate will challenge your logical brain!Hidden picture puzzleswill have you searching the amazing photos for parts hidden withinthem. Fun for hidden object fans.Time your chain reaction perfectlyand uncover the hidden pictures.FEATURES: - 7 Different classiclogic puzzle games for you to enjoy.- 4 Difficulty modes startingat simple puzzles designed especially for kids, progressing to moredemanding levels for adults and puzzle experts.- Challenging andaddictive gameplay.- Fun puzzle games.- Child friendly gameplay andfun.